You'll be downright arresting in the Leather Mens Jodphur Pants , a pair of made to measure leather trousers that will cling to your figure in all the right spots. You'll be downright arresting in the Leather Mens Jodphur Pants , a pair of made to measure leather trousers that will cling to your figure in all the right spots. The area across the hips and pouch is fitted before the legs flare to an extra wide thigh area. Then, the legs straighten again to fit comfortably into Dehner boots, which you can shop leather pants right here at Leather Baba. 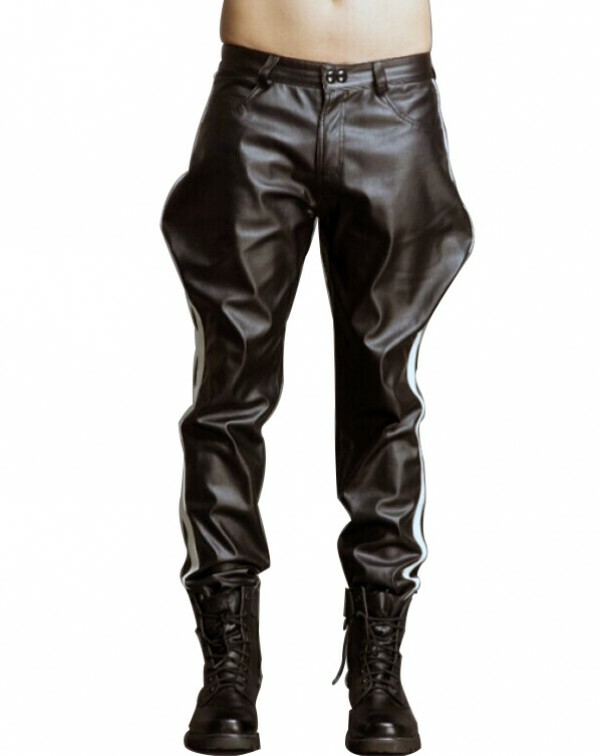 In the back, a breech style rear adds a naughty touch to these leather Pants. The sides are accented by a 1-inch stripe, and there are zippers at the ankles in case you want to wear the pants over top of boots. Slash pockets are positioned at the hips, and the pants are fastened by a single snap and a zip.